Many microcontroller projects involve the use of sensors like Accelerometers, Gyroscopes, Temperature, Compass, Barometric, Current, Proximity and others. Some sensors have I2C or SPI interfaces but there are still a great many which produce an analogue output voltage. These are measured with the use of the built-in Analogue to Digital Converters (ADC) included in microcontrollers. However, if you are using many sensors and don’t have enough ADC inputs, or have used those pins for other functions, you either have to upgrade to a larger microcontroller with more inputs or resort to using an external (and sometimes expensive) ADC chip. 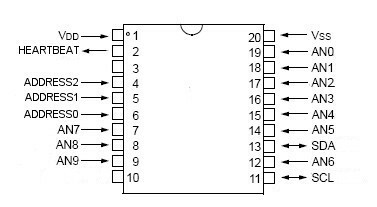 Apart from supplying power to the chip, simply connect pin 13 (SDA) to Arduino UNO pin A4 (SDA) and connect pin 11 (SCL) to Arduino UNO pin A5 (SCL). Use pullup resistors on these 2 pins (4K7). Use the sketch below and try it out.